AÂ project is in its finalÂ phases when it gets to theÂ part of the Gant chart that says ‘usability testing’, and so they do. People come in and are asked to perform tasks, and so they do, with greater or lesser degrees of difficulty. And yet, something else isÂ wrong. It’s not so much that they *can’t* use your website, it’s just that they don’t want to. People ask me all kinds of questions about usability. What are the most common usability problems? What’s the best way to make sure our site/application/system is usable? That kind of thing. It’s pretty clear when they ask these questions that they’re thinking on the presentation layer. Is that button in the right place? Is it big enough? Has it got the right label. Now, don’t get me wrong, the presentation layer is important, but it’s not the biggest usability problem I see in my work. The biggest problem is that you’re designing something that people don’t care about. You’ve got your proposition wrong. What’s your proposition? Well, basically it’s the value you’re offering to your customer. Are you offering something they want? Are you solving *real* problems for them? You’d be amazed how often this is not the case, and how often people don’t know about this until they’re about to launch their product or, worse still, once it has launched and is failing. The diagram above is one that I pull out fairly often these days (it’s another one I’ve borrowed from Flow). 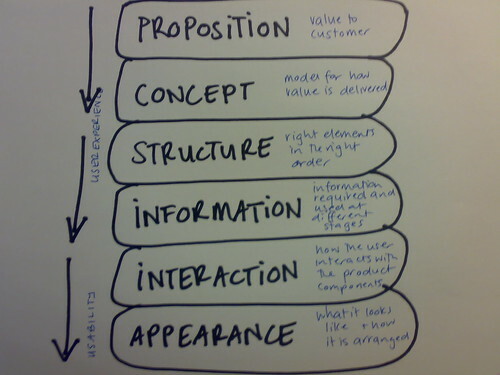 It talks about how you need to design from the proposition down. You need to get the value offering right, then look at the model for delivering that value to clients at a conceptual level, then start looking more at what elements go on a page, what functionality is included, how it is structured and ordered. Unless you have all of these in order, it doesn’t really matter where your buttons go or what they’re labeled. Appearance level usability is the most superficial, easily remedied and perhaps even least important of all of the levels of design. If you’ve got a flaw in your thinking at the top of the chain, then no amount of surface usability is going to save your product. So, how do you approach this kind of Proposition design and usability? It’s pretty simple really, you test your proposition. This kind of testing (or really, research) is more about talking than tasks, and it’s about understanding your customers better and checking whether you are conceptually on the same page as they are. I’ve been involved in several projects just in the past twelve months where doing this kind of research has saved companies tens of thousands of pounds (double that if you’re talking dollars) in *not* designing and developing functionality that either was unwanted by their customers or was designed to solve the wrong problems. Working this out when you have a few pencil sketches or a couple of visio wireframes with a few days invested is an awful lot better than working it out when you get to the ‘usability testing’ line in your Gant chart. So, if you really want my advice about usability, it’s that it starts right at the very beginning. Before a line (or a box)Â has been drawn. If you’re not designing the *right thing* then no amount of design expertise is going to get you a really usable product. Talk to the people you’re designing for. Great Post. Conceptually similar to “designing from the epicenter”, and “simplifying the problem”. Oh sweet music. The absolutley very first thing you prototype is the proposition. The ‘Why’ to buy. If we’re leading with desirability (as opposed to feasibility and viability) then we’re already beginning to de-risk; plus if you’ve spoken to users and you return to them with propositions AND they give you a tentative thumbs up then you’ve a good hunch you’re headed in the right direction. And here’s the pinch – if you can’t describe the idea in words (an old fashioned ‘elevator pitch’ if you like – the who, why, what, where etc.) then no amount of slick design, EA, IA, IaD, code, etc. etc. will make a jot of difference. You ain’t going any further. In addition to the quantifiables you can entertain, suggest, challenge, help and most importantly… make people think, about the right things. People like to think every so often, otherwise the sudo would come filled in. Hi Leisa… first time reader. This post came up in a Google Alert today for an alert I have ‘usability’. I immediately came and read what you had to say and loved it. You have summed up a great introduction to this problem, and I can only agree with everything you said. I liked it so much that I have posted a reference to this piece on my Blog today. Off to read more of your now. Thanks for writing. Ah… and the trackback came too. Guess you would have figured the rest out. Terrence – I love the term ‘designing from the epicenter’. I’m going to borrow that if you don’t mind! Alex – great point re: the elevator pitch. I think this is almost always true … although, then I think about Twitter how it’s elevator pitch is actually pretty lame but I think it’s actually amazing… so I guess there are exceptions. (And let’s not get started about the problems with Twitter’s interaction & appearance layers! I like the “polishing a turd” metaphor. Anything that can be expressed in scatological references or barnyard metaphors is always a good thing, in my mind. I can’t take credit for epicenter design – that comes from 37signals. I was wondering how many of my customers I could use the ‘polishing a turd’ metaphor with. So tempted, so often! I tend to talk to clients about the best they can expect unless they think about the proposition is a “brilliant solution to a non-existant problem”. That generally gets people to sit up and take notice. Very good point indeed, Leisa. And it was something I had in the back of mind during the recent Sydney BarCamp. There was a clear theme of ‘start-ups’, with many people enthusiastically speaking about their big ideas. This is great, but to be totally honest I would say many of them hadn’t really thought their ideas through. They hadn’t tested their proposition beyond their own atypical POV (ie geekhood). Don’t get me wrong, it’s not the fact that they were geeks (I am one too) but the intended audience for most of these start-ups was not predominantly geeky. I’m really late to the conversation here, but I have to ask… how do we, exactly, validate the value of an offering, if people are bad at reporting their own behavior? If a customer says, when looking at a prototype, oh yes, this is something I would use, or love to have, do we take them at their word? How many thumbs up equal validation? If there are other resources where I can read about this issue, I’d love to know where. Great post, I couldn’t agree more : without a solid idea/service to rely on, even the most dashing HCI is no more than an empty shell. I’ve got a vocabulary question though : you seem to consider that the Proposition is a part a usability (opposed to “surface usability”). But isn’t the word “usability” precisely supposed to leave aside the profound matters (the proposition) and focus on the surface (= the interface : buttons, labels,…) ? Isn’t there a better word like “usefulness” or “utility” to describe the fact that there is a real added value ? It may be my French interfering, but I’d like to know what you guys think about it.